Muslim worshippers of the Jamrud area of Kyber agency were brutally blown to death, during Friday prayers today, the 18th roza of Ramazan this year. The blast left over 50 people dead and numerous injured. This isn’t the first time a mosque has been attacked. 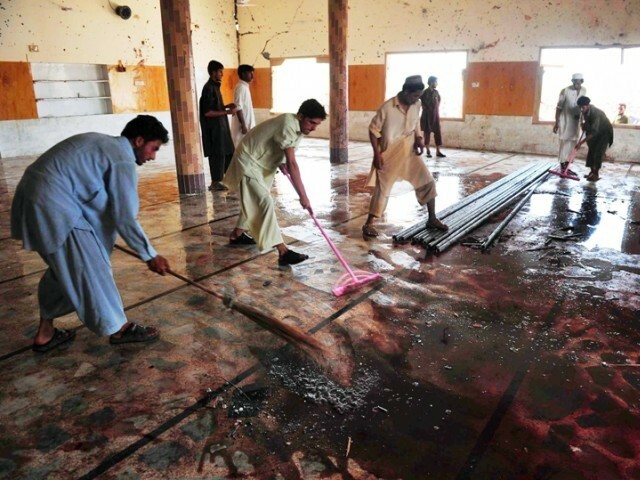 Most of us remember how only a few years ago mosques were the target of sectarian attacks; in fact, there was a mosque attack in March this year. Ramzan is supposed to be a blessed month; but this year has been particularly ‘bloody’ for the people of Pakistan. In Karachi, over 50 people have been killed in less than two days, and many are still missing. Morgues are running out of space , while blood banks are running out of blood for those injured in the spree of violence. The city police have today said that it will conduct an operation after this recent upsurge in attacks. Then again, our police officers, perhaps, will still be more interested in putting people behind bars for not fasting as opposed to putting people behind bars for killing. While people continue to die, an average citizen wonders who to blame for not doing anything regarding this unrest – the police, the rangers, or the government as a whole? Those who have been affected will be shown countless times on television blaming the government, asking for help or crying till their eyes are red and swollen. Television channels show continuous footage of the injured and deceased, footage of their family members, and reports on how sacks full of dead bodies are being found. But what good is this media attention if the government just won’t listen? What becomes of the mother whose child is missing or dead? The government doesn’t care. A spokesman will come on television and make a face saving statement claiming how “in a city like Karachi, people die every day.” No big deal, right? It is now being said that martial law needs needs to be imposed, or Karachi is fast moving towards a civil war. It makes me cringe and shake in horror to imagine what kind of violence that would bring on. Perhaps we should be saying a prayer for peace in the blessed month of Ramazan; pray that God might help bring peace to our country. An undergraduate student at Lahore University of Management Sciences. She blogs at onwriting286.wordpress.com. if the government just won’t listen? The government doesn’t care. First of all, nicely written blog. I just wanted to say that the government is definitely listening, unless they are deaf Obviously, they don’t want any of this to happen any more than we do. I am not the biggest fan of Pakistan’s government, but it inherited a war that we shouldn’t have been involved in, in the first place. So many soldiers, cops, investigators etc. are dying every month. They are all part of the government. It is fine to express such strong sentiments, but how can you stop a mad man who straps a bomb to himself and runs into a mosque? @ Noman Ansari….U’ve failed to get the message of the article….If the GOP does care can u pen down some efforts it has taken to contain this mindless violence. Everyday we hear that the govt is not going to tolerate the violence, but we witness that the the Govt’s tolerance grows in direct proportion to the violence. And just how do u blame the war that we inherited for issues Karachi is facing. If that was the reason whole Pakistan should be facing riots. Govt of Pakistan has its priorities misplaced.When it comes to tackling Karachi, every move is viewed through the prism of votebank and their lies the problem. Its a lack of will on Govt’s part and that makes it an equal accompalice in wat is happening in Karachi. Let us for once stop blaming external factors for our woes. Thank God Indian Muslims have India. Just because you are tired of hearing something, doesn’t make it any less true. Don’t ignore the reason behind my arguments with passionate rhetoric. Yes, we all want the suicide attacks to stop. And bears poop in the woods. Not a secret. Please tell me how you want to stop suicide bombers from hitting mosques. I think all of Pakistan would love to hear it. Anyone can go on passionately about innocent lives lost, and blame the government. How about a solution? It is very easy for anyone to sit behind their computer and talk about ‘lack of will‘. Do you think any government wants madmen to go into mosques with bombs and slaughter innocents? That’s just a giant cliche. There is a cloud over your head and it is raining. You might get tired of hearing about the cloud, but it is there. Stop blaming external factors? It is these external factors that brought suicide bombing in the first place. Were there suicide bombings before the Taliban came into Pakistan? No. Were there suicide bombings before we got involved with the drone attacks? No. Were there suicide bombings before America threatened to bomb us into the stone age, if we didn’t cooperate? I condemn the despicable attack completely.All mosques in Pakistan should employ body-scanners and the source of explosives/arms/ammunitions etc. should be found out. @ Noman Ansari..Lets keep this arguement limited to this particular suicide bombing…Ur explanation is that a teenager walks into a mosque and blows himself up because of external factors.Shia-Sunni rivalry is age old and plz do not blame USA for that. Its the madrassa culture of Pakistan thats responsible for these suicide bombings and brainwashing of teenage minds. How would u explain killing of Salman Taseer and subsequent bestowing of Hero status on his killer????? Hope u hadn’t closed ur eyes to the scene were learned lawyers were all over each other to garland Qadri and raising slogans praising his act.???? Well, as per u, u would still blame external factors….Qadri killed Taseer because Russia occupied Afghanistan ! Shahbaaz Bhatti was killed because US threatened to bomb Pakistan to stone age. Shias n Sunnis keep killing each other because of US presence in Afghanistan….Mukhtaran Mai was raped because India has occupied Kashmir !!!! The truth is that general public of Pakistan is blinded by their religion. Islam is definitley a religion of peace and their are no 2 ways about it, but the same cannot be said about his followers. Can u explain y the Govt is reluctant to amend Blasphemy laws??? Can u explain y no action is being taken against the rioters in Karachi who are killing with impunity??? OK, you claim you want to just talk about the suicide bombing that occurred, then you go from that to a few dozen other issues, contradicting yourself. But you speak of various incidents, conveniently skipping bits that don’t support your argument. The root of this problem is the war we got involved in. You skipped the root, skipped the fruit, and keep pointing at the branches. It is kinda useless to talk to someone who is only interested in being right. Really, how can you bring up the Salman Taseer murder in the middle of a discussion about a suicide bombing. Silly. No prayer can help you if God has forsaken you. Pakistanis refuse to understand and deal with their problems and instead adopt measures which only make things worse. This nation has been forsaken by God because the people themselves do not want to change things around them and think that only praying to God will solve all their problems. Well keep praying then.